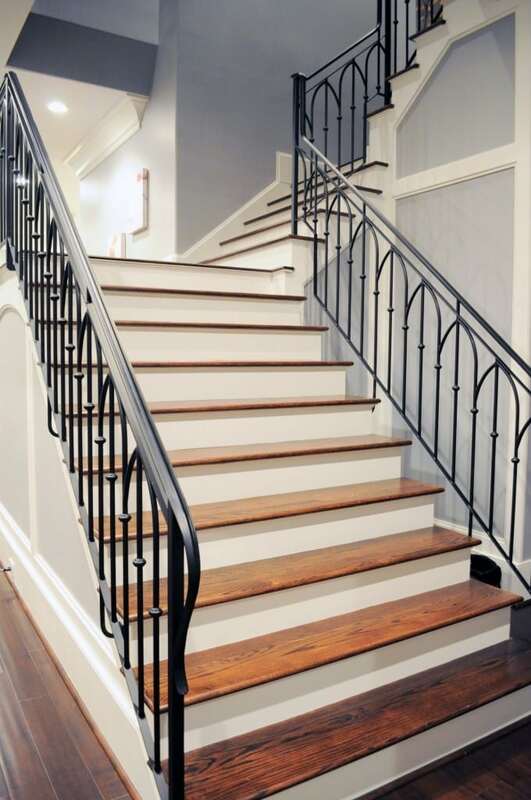 A custom wrought iron stair railing can beautifully accent a straight or curved staircase. Offering striking appeal and versatility, ornamental metal is a popular accent choice for both commercial and residential spaces. Our design team is proud to create innovative, custom handrails that take staircases to a new level. While the style options are limitless, we ensure quality and consistency in each wrought iron project through a proven three-step approach. This week, we explore the process, from design to delivery, and discuss several top features of wrought iron railing design. From Design to Delivery: The 3-Step Process for Wrought Iron Stair Railings. Our industry-leading design team possesses the creativity and capability for limitless customization of wrought iron stair railings. Our experts work collaboratively with each client to design the perfect handrail for his/her space. Committed to balancing style and aesthetics with budgetary and space needs, our team utilizes value engineering processes to maximize the project and minimize costs. In the design phase, we provide CAD drawings, renderings, and 3-D modeling to ensure that the railing captures the client’s unique vision and style. Once all renderings and drawings have been approved, the wrought iron railing is constructed. Each piece of wrought iron handrail is hand-welded in our state-of-the-art metal facility located in Alpharetta, Georgia and Charlotte, North Carolina. Our welders leverage extensive skill and industry knowledge to create the highest quality works of metal, meeting all project parameters including cost and design. We are committed to customer satisfaction and on-time delivery in every project. Thus, we make the third and final step of wrought iron handrail delivery simple. Through our turnkey installation process, the complete staircase and handrail are delivered to the job site and installed by our expert team. The immense popularity of wrought iron railing is due in part to its versatility. 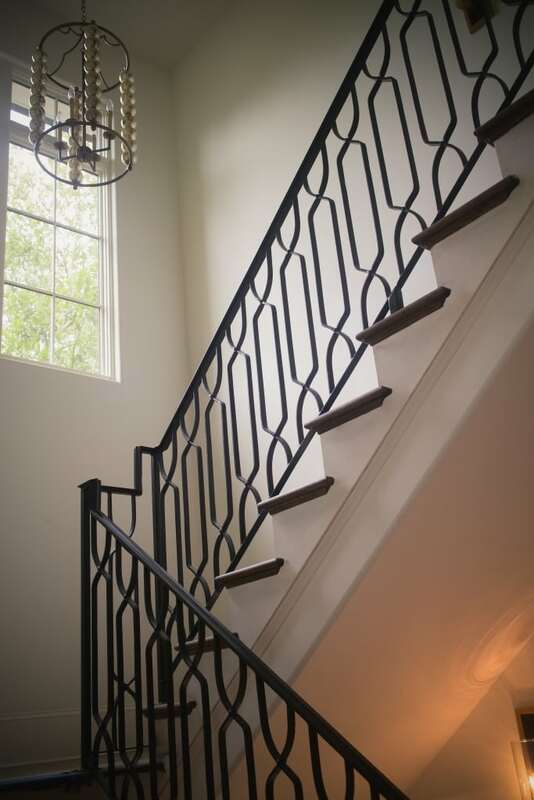 With a wide array of design components in both hammered and smooth powder-coated finishes, wrought iron offers options for spaces and staircases of all types. Let’s take a look at some of the top features of modern and classic wrought iron designs. With clean, parallel lines, our Alec, Cade and Laurent designs are true displays of modern style. Their simplistic yet sophisticated shapes promote a sleek aesthetic quality. These handrails are used to create open space, limiting distraction from the home’s design elements. Structured, geometric shapes – both circular and square – create a balanced architecture with smooth finishes. For those seeking a classic style, the charming Archer and Willow designs are highly popular. Crafted with expert skill, their vintage, ornate patterns are sure to be admired. With gentle curves terminating in style with lamb’s tongue, these designs are a timeless complement to a straight or curved staircase. With its strength, durability, and versatility, wrought iron is an excellent choice for handrails of all styles, both traditional and modern. 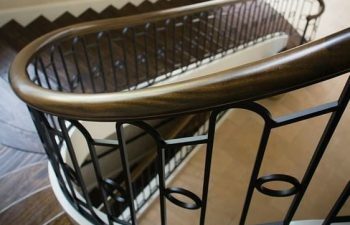 Check out our previous blog for additional photos and details from 5 of our favorite wrought iron stair railing designs. Visit our wrought iron stair railings product galleries for additional details and pictures on our exquisite projects. From inspiration to installation our team is committed to designing and building the highest quality custom staircases and handrail systems. Our reputation speaks for itself, and client satisfaction is our highest priority. Contact us today to discuss your next wrought iron stair railing project.